2mm delicate carbon steel gouge blade, made specifically for effective enucleation. Pack of 100. Single use. 5mm delicate carbon steel gouge blade, made specifically for effective enucleation. Packs of 100. Single use. 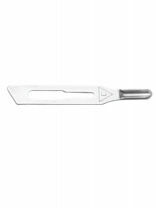 1mm delicate carbon steel gouge blade, made specifically for effective enucleation. Pack of 100. Single use. 3mm delicate carbon steel gouge blade, made specifically for effective enucleation. Packs of 100. Single use. Sterile Podiatric Gouge Blades for single use. Stainless Steel.